Come visit our lovely 3 bedroom cottage on the cove. Now with high speed internet, you can even stream videos!! The cottage is on the water and only minutes from Reid State Park beach. We include a park pass which is valid for all Maine state parks. Admission to the beach is $6.50 per person. Therefore, the park pass really saves. You can take a stroll, go fishing off the float, take out one of the kayaks or just relax on the deck and enjoy the view. Take a lighthouse tour or go shopping in nearby Bath or at LL Bean in Freeport..
Hi, My name is Howard and I am a full time lobsterman here in Georgetown. Also, I am the owner of this beautiful rental cottage. It's really great meeting the fantastic folks who rent the cottage every summer! The cottage was newly built in 2004 and is situated on Robinhood cove with 210 feet of frontage and a pier and float. We are near the beach Reid State park and include a park pass. There is a lovely deck with water views, lots of space and privacy too. Lovely tile bath. Full size bath and shower. Wifi DSL video streaming is so so, but extremely adequate. A pier and float, 2 kayaks, canoe, fishing poles. This whole property was just wonderful! The cottage was everything it said it would be; clean, attractive and comfortable. We found everything we could possibly need from good kitchen equipment to kayaks. It was really cozy on the cool fall nights. Even though it rained some we found a gorgeous hike ( the Audubon Trail right down the road) and we kayaked a few miles in each directions and saw Eagles and Harbor Seals and GBH's and a Barred Owl and even a Pileated Woodpecker. Harold was Stealth ( we never saw him) but completely accommodating, and answered all our questions promptly via email. The beaches ( Reid State Park and Popham Beach) are terrific and Brunswick and Bath have great food and fun stores. I have stayed in many different places over the years in this area and Cottage By the Sea is the best by a mile! I highly recommend it. This cottage was very quaint it had all the amenities you need to enjoy your stay we relaxed and took in the scenery it was clean and accommodating. The general store in town sold the lobsters by the pound we were able to bring back to our cottage and enjoy a nice dinner there was so much to do we have a short time we drove to Acadia national Park beautiful views went down to Bar Harbor to enjoy the wharf. Great location. Handy to Reid State park. Beautiful view and access to water. Well stocked kitchen. Worth returning to. 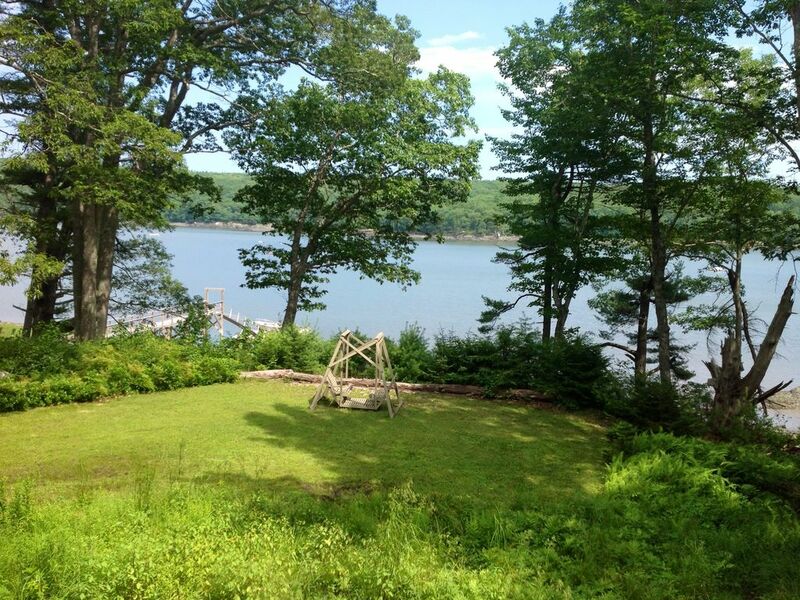 Beautiful retreat with a waterfront view, kayaks, a canoe, and a state park pass included! We really enjoyed our week-long stay at Howard’s cottage. What incredible views of Robinhood Cove! We loved the quiet mornings and evenings on the deck. The included access to kayaks, a canoe, and a state park pass really made this property a great value! We were there in the hottest part of summer (late July / early August). Since the cottage doesn’t have AC there were a couple of nights that were pretty warm/humid in the bedrooms. Overall the cottage was exactly what we were hoping for: a quiet, beautiful, and relaxing retreat! Our family was pleasantly surprised by the Cottage on the Cove. The photos do not do justice to this adorable gem in the woods. We enjoyed our morning coffee on the deck that provided a lovely view of the Sasanoa River and Robinhood Cove. The kayaks gave us and our pup many enjoyable hours paddling around the Cove. Just mind the tides. The float is completely in the mud at extreme low tide. The cottage is well stocked with linens, towels, kitchen items and paper products. No need to bring anything! Be sure to stop in the Georgetown Country store for fantastic lobster rolls and haddock sandwiches. The locals eat there so you know it’s good! The sweet little Five Islands Market has a good craft beer selection, local produce and blueberry pie! Both are only a few miles from the cottage. Be sure to use the park pass provided to visit Reid State Park. It is stunning! But, bring bug spray! You can also use the pass for Popham Beach, but beware it is very popular so go before 10 am. They close the park when at capacity! We were so disappointed to be turned away after a 35 minute drive. But lunch at the hidden North Island Market cheered us up considerably. The produce stand and beach stand on the way to Popham Beach sells Trish’s blueberry pies. Get one! The town of Bath is adorable. Be sure to check out Reny’s store. Teen daughter loved it! Bath Brewing Co. is a great stop for a pint and appetizers. There is an IGA market for groceries. We visited Freeport, the home of LL Bean and many other cute stores for a day of shopping. Check out Derosiers pizza for the best (and least expensive) lobster roll in town. We also visited Portland for a day of brewery hopping and lunch. We highly recommend the Portland Pottery Cafe. The lobster and corn chowder and the huge baked goods got two thumbs up! Be sure to ask the cottage owner Harold, he lives next door, for lobsters. He is a lobsterman-they don’t come any fresher! All and all a wonderful vacation and we hope to return next summer! Thanks so much for your thoughtful review. I’m so glad your family enjoyed the cottage. It was great meeting you folks and the cutest little dog in the world!! The cottage could not have been more charming. Well maintained property with all the comforts of your own home. Perfect nights spent sitting out on the dock having conversations. Owner was more than hospitable. Will be returning there next year for certain.